ST. THOMAS (CBS USVI) — A big announcement for the Virgin Islands and for the people at the Family Resource Center in St. Thomas. They said this could completely change the way they do their work. “It’s going to save us a lot of money,” Viviane St. Juste the Executive Director at the Family Resource Center said. A life changing announcement for the Family Resource Center in St. Thomas, who spend their days helping victims of domestic violence and sexual assault and also the perpetrators, as they hear their electric bill could be lowered. 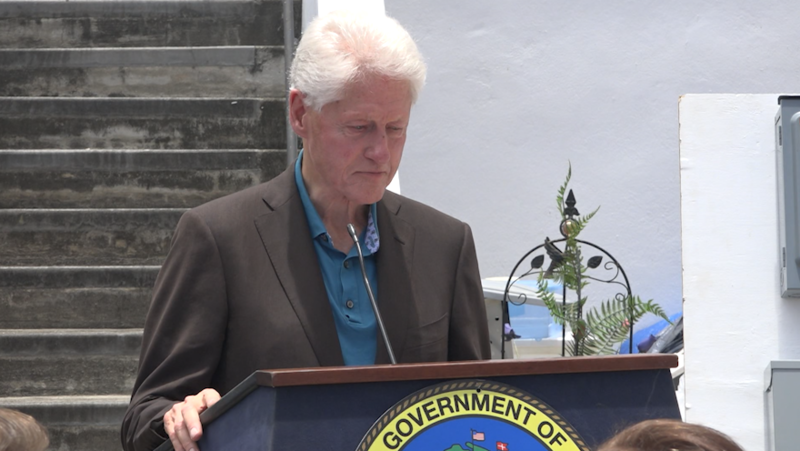 “We all know we’re here today because some of the most significant hurricane damage was manifested in the loss of power,” Former President Bill Clinton said. Clinton delivered a message of hope for workers with a promise to install solar panels at the center. A part of the Clinton Foundations mission to help in the aftermath of last years storms. “I’m very heartened by this, and I am glad that people still want to work on it and I’ve very grateful to Tom Secunda and the Bloomberg group. They’re really making a difference here and every place needs a team on the ground that can solve these kinds of problems,” Clinton added. The Family Resource Center on St. Thomas is just one of the three sites being solarized. Two of three schools on St. John are also getting solar panels. This with the help of the Clinton Global Initiative, Tom Secunda co-founder of Bloomberg and Bloomberg Philanthropies. “All part of the efforts, especially for the Bloomberg Response Team whose been here on the ground since Irma both working with the government and helping out on all three islands on power restoration and hurricane recovery all around,” Beth DeFalco with Bloomberg Philanthropies said. In addition to working with the government, Virgin Islands Governor Kenneth Mapp shared a regulatory change that will allow people to install solar and still stay on the grid. “We start getting the work done, I’m going to be meeting with the WAPA board and the PFC to talk about the rules as WAPA adds the new generating systems in then you give opportunity for more net metering because you can control your production against your demand,” Mapp added. As the Family Resource Center prepares to get their new panels, they’re just grateful their agency was selected. “To have an electric bill that’s going to go from 1900 dollars to whatever is going to be less is exciting to me, because with those funds saved we can help more persons,” St. Juste said. Those tell me they’re not exactly sure when the work will start on installing those panels but they are sure that the foundation will keep their promise and they are excited to see where else these panels may be installed throughout the Virgin Islands.